James Cagney was born on 17th of July 1899 and was an American actor and dancer, both on stage and in film, though he had his greatest impact in film. Ηe won acclaim and major awards for a wide variety of performances. He is best remembered for playing tough guys in movies such as William A. Wellman’s The Public Enemy (1931), Michael Curtiz’s Angels with Dirty Faces (1938), Raul Walsh’s White Heat (1949) and Gordon Douglas’ Kiss Tomorrow Goodbye (1950).In 1999, the American Film Institute ranked him eighth among its list of greatest male stars of Classic Hollywood Cinema. Orson Welles said of Cagney, “he was maybe the greatest actor who ever appeared in front of a camera”, and Stanley Kubrick considered him to be one of the best actors of all time. He spent several years in vaudeville as a dancer and comedian, until he got his first major acting part in 1925. He secured several other roles, receiving good notices, before landing the lead in the 1929 play Penny Arcade. After rave reviews, Warner Bros. signed him for an initial $500-a-week, three-week contract to reprise his role; this was quickly extended to a seven-year contract. 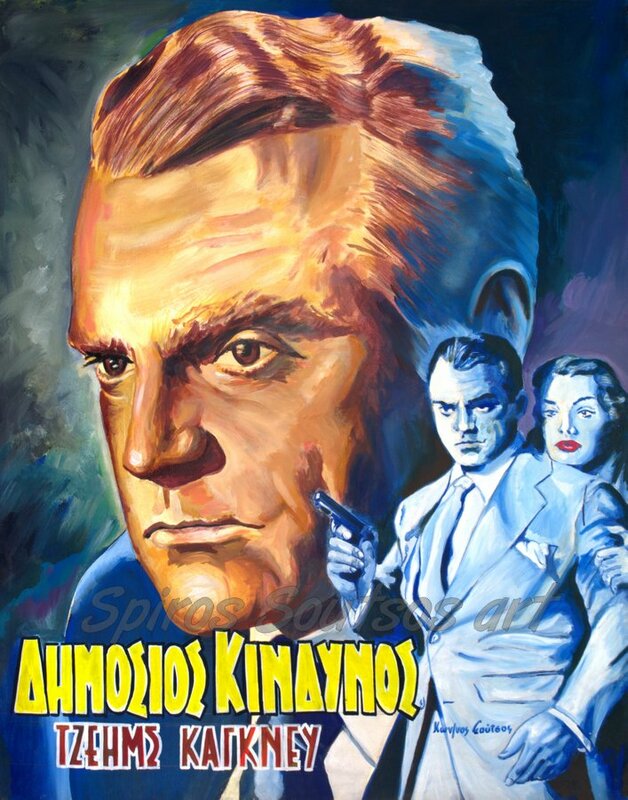 Cagney’s seventh film, The Public Enemy, became one of the most influential gangster movies of the period and is considered as one of the best three gangster movies of the 1930’s, (the two others are Mervyn LeRoy’s Little Caesar (1931) with Edward G. Robinson and Howard Hawk’s Scarface (1932) with Paul Muni. The film was directed by William A. Wellman and Cagney plays along with Jean Harlow, Edward Woods, Donald Cook, and Joan Blondell. Notable for a famous scene in which Cagney pushes a grapefruit against Mae Clarke’s face, the film thrust him into the spotlight. He became one of Hollywood’s biggest stars and one of Warner Bros.’ biggest contracts. In 1938, he received his first Academy Award for Best Actor nomination, for Angels with Dirty Faces. In 1942, Cagney won the Oscar for his energetic portrayal of George M. Cohan in Yankee Doodle Dandy. He was nominated a third time in 1955 for Charles Vidor‘s Love Me Or Leave Me. Cagney retired from acting and dancing in 1961 to spend time on his farm with his family. He exited retirement, 20 years later, for a part in the movie Ragtime (1981), mainly to aid his recovery from a stroke. Cagney died at his Dutchess County farm in Stanfordville, New York, on Easter Sunday, 30 March 1986, of a heart attack.